The US, French and German leaders have condemned Syrian President Bashar al-Assad over the use of "indiscriminate violence" against protesters. President Barack Obama called France's Nicolas Sarkozy and Germany's Angela Merkel to discuss new measures against Damascus, the White House said. 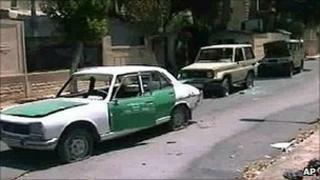 Earlier, Syrian activists said security forces shot dead at least 24 people in unrest across the country on Friday. The protests show no sign of abating, despite a government crackdown. "The leaders condemned the Assad regime's continued use of indiscriminate violence against the Syrian people," a White House statement said. "They welcomed the August 3 presidential statement by the UN Security Council condemning Syria's actions, but also agreed to consider additional steps to pressure the Assad regime and support the Syrian people." It was not immediately clear what the new measures could be. Correspondents say the US appears to be heading towards a direct call for President Assad to step down, after saying earlier this week that his presence was now fomenting instability. Meanwhile, the US state department has urged its citizens to leave Syria. The White House statement came after thousands of Syrians again took to the streets after Friday prayers - the first Friday in the holy month of Ramadan. Syrian state TV broadcast from the city of Hama - which has become a focus of the protests against Mr Assad's rule - saying the city was now under government control. The city has been under bombardment for days as tanks and troops sought to regain control from opposition groups. Unrest was also reported on Friday in the suburbs of Damascus, where at least 10 died in clashes, according to the Syrian Observatory for Human Rights. Video posted on the internet said to have been filmed in the capital showed crowds chanting: "Hama, we are with you until death" and "[President] Bashar [al-Assad] leave". Abdel Karim Rihawi, head of the Syrian League for the Defence of Human Rights, said 30,000 people had marched in the city of Deir al-Zour. Activists say about 2,000 people have been killed in clashes since protesters took to the streets in March. Mr Assad has promised reforms, but blames the violence on "armed criminal gangs" backed by unspecified foreign powers. Access for international journalists in Syria has been severely restricted and it is rarely possible to verify accounts by witnesses and opposition groups. Earlier this week, the UN Security Council issued a statement condemning the crackdown. Russia, traditionally an ally of Syria, also joined the criticism, with President Dmitry Medvedev saying Mr Assad would "face a sad fate" unless he urgently carried out reforms and reconciled with the opposition.